In addition to the design and building of new homes, R & K Custom Homes is your source for home additions and renovations. We do it all! Bring us your ideas and we will turn them into reality! We offer various and unique models that can be customized to your needs. R & K Custom Homes offer many floor plans to suit your style of living with amenities providing comfort and ease. Whether you are expanding your living space or considering downsizing, R & K Custom Homes will review your options to meet your family’s needs and budget. Through your comprehensive client meetings, we help you determine style and preferences prior to designing or selecting a floor plan. You are never alone throughout the process. Our designs were developed over the course of years as a result of popular and repeated requests from our clients. The design process is a collaborative effort with Joe Kolarik guiding the project every step of the way! R & K Custom Homes is a fully licensed and registered PA Home Improvement Contractor. We continuously keep abreast of the latest rules, regulations, municipal codes and standards in order to provide you with the safest finished product. From glass technology to wood, laminate, fits and finishes, R & K Custom Homes offer the latest the industry can provide. R & K Custom Homes believe the customer is the most important aspect of our process. “We want to make sure you are well informed on all aspects of this important project,” states Joe Rocco. “We will provide you with weekly status updates and same day updates for any urgent issues that need to be addressed immediately.” We talk to clients on a daily or weekly basis and all clients are welcome to come and walk the job site as we progress. There is nothing like seeing your dream house constructed room-by-room and ensure you are getting everything that is on your dream list. Free consultation and estimates! If you’re looking to acquire land for your home building site, R & K Custom Homes can help. We have extensive experience with both building in the community where we provide the lot or on a parcel of land that you already own. We are familiar with most available parcels in Eastern Pennsylvania and will be happy to advise our clients and help save time and energy. R & K Custom Homes will be your guide in the search for the perfect setting that is ideal for the type of house you want to build. We are aware that permit requirements change from township to township and we have the extensive experience working with the licensing offices across the region. Our experience in recognizing the ideal building site will enhance the livability of your home. R & K Custom Homes offers the same exceptional construction standards when working on your addition or remodel as we did during your new home build. Quality is never compromised no matter how large or small the job may be. R & K Custom Homes takes a special focus and interest in designing and building homes to be highly energy-efficient and eco-friendly. A whole-house system approach helps homeowners and builders develop successful strategies for optimizing home energy efficiency through careful planning and attention to detail. To ensure that your new home takes full advantage of a whole-house efficiency approach, we work closely with our clients from the beginning of the design process to arrive at the most cost-effective and energy-efficient solution. R & K Custom Homes utilizes the Keystone Energy Program, and each step of the way through three inspections, the quality and fit of your home will be checked and verified to ensure high energy efficiency is achieved. The owners and craftsmen at R & K Custom Homes hold regular meetings to ensure you are fully aware of each part of the project as it progresses. Our craftsmen are here to assist you, making recommendations on all aspects of your home build or remodel. With over 35 years of experience, our team has the experience and expertise to get the job done which will meet or exceed your expectations. Fully licensed and ensured, our team of diverse tradesmen offers years of experience with creating and remodeling custom home solutions that will meet your family’s needs. Contact R & K Custom Homes today to schedule your free, no obligation consultation! Whether you’re looking to build a new home or renovate your current home, we have the tools and skills necessary to help you. R & K Custom Homes never cut corners when it comes to the materials we use on our construction jobs. When you work with R & K Custom Homes, you’ll not only expect the best, but you’ll get the best. No company can offer better quality than R & K Custom Homes. We have worked with our suppliers and materials for years and have developed trusted relationships with our suppliers and affiliated companies. We are at our best and our clients benefit from our long-standing partnerships. R & K Custom Homes choose companies with high standards and high-quality materials so that our clients and homes will stand the test of time and feel a pride of ownership for the duration of their ownership. Stefonak Custom Kitchens - A leader in fine custom cabinets since 1951. Moen - Buy it for looks, buy it for life® is their trademark and we agree. Moen is as functional as it is beautiful. Andersen Windows & Doors - Andersen is the largest window and door manufacturer in North America. GAF Roofing - Beauty you can trust, beauty that will last. CertainTeed - Performance, beauty, choice of styles, the reason we work with Certain Teed Saint-Gobain products. John Manville Insulation - Unique building solutions for both residential and commercial applications. Gerber Plumbing Fixtures - Gerber, strong since 1932, designing for the future. CLOSETMAID - Design for todays living, custom closet solutions. Kohler - Timeless and timely, Kohler matches the most demanding lifesyles. Daltile - Tile has never been this flexible before – choose colors, styles, designs and endless patterns. Mohawk Flooring - Flooring choices for all spaces, textures and uses. Mohawk is what’s underfoot. Fireside Hearth & Home - Gas, wood and pellet fireplaces and hearth products. Rheem - Heating, cooling, pool and spa heating products, the largest manufacturer in North America. 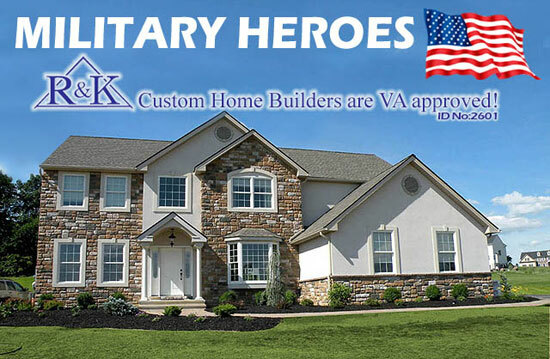 Contact R & K Custom Homes today! Begin your exciting journey to creating the home of your dreams.